The postseason for high school football is upon us. Several local teams look to secure trips to the state playoffs. The state preliminary round will take place November 6 and 7. What follows is a look at who’s in and who they are playing. Does the Class 2A state football playoffs this year go through Thurston County? It certainly seems so. Tumwater, River Ridge and Black Hills all enter the playoffs following stellar regular seasons. The Thunderbirds, champions of the 2A Evergreen Conference and the top-ranked team in the classification, registered its third consecutive and 14th overall undefeated regular season. 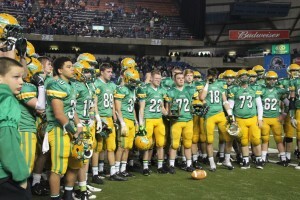 Twice Tumwater has emerged as undefeated state champions, accomplishing the feat in 1989 and 1990. Tumwater High School is poised for a return to the state football championship. The team is shown here following the 2014 state playoff. The T-Birds (9-0) are now five victories away from doing it a third time and if the previous nine games are any indication, the likelihood of that happening is extremely strong. Tumwater, which averages nearly 47 point a game, has posted numerous lopsided victories this season. The average winning margin this year has been 35 points with Lake City of Coeur d’Alene, Idaho being the only squad to get within 28 points of Tumwater, losing 35-21 on September 25. The T-Birds open the state preliminary round on November 6 when they host Mark Morris, the No. 4 seed out of the 2A Greater Saint Helens League. The teams last squared off in 2004 with Tumwater defeating the Monarchs, 42-29. Tumwater has scored 42 or more points in all but one contest this year and despite pre-season all-state selection Easton Trakel missing several games this season with a hamstring injury, the team still has a wide variety of offensive weapons at its disposal, including senior receiver Griffin Shea, senior running back Jarid Barrett and junior tight end Cade Otton. Senior quarterback Spencer Dowers gets the majority of the snaps with speedy junior Noah Andrews stepping in on occasion to give the T-Birds a different look. While its old hat for Tumwater to post an undefeated regular season, South Puget Sound League 2A champion River Ridge (9-0) is coming off its first in school history. 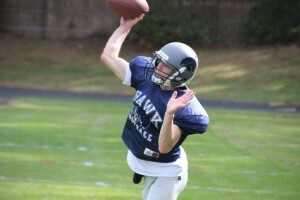 Kobe Key, an all-league quarterback for the River Ridge High School Hawks, releases a pass in a recent practice. The Hawks will have to wait to see who they face to open the postseason. They will play the winner of a November 3 game between Renton (4-5) and Sequim (5-3). It will mark the first home playoff game in school history for River Ridge, which opened its doors in 1993. The Hawks are looking for back-to-back state playoff berths. 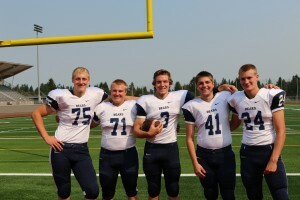 They lost to eventual state runner-up Lynden, 41-21, in the first round last year. The program’s only other state playoff appearance occurred in 1998 when they advanced to the 4A quarterfinals. Dual-threat senior quarterback Kobe Key is 18-2 as a starter and is backed by a large offensive line and several lighting fast playmakers. River Ridge isn’t alone in registering its best regular season ever as Black Hills, runner-up of the 2A EvCo, finished a school-best 8-1 with its only defeat coming at the hands of Tumwater, a 42-14 loss on October 23. 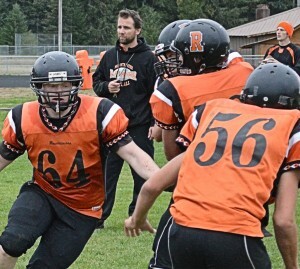 The Wolves will host R.A. Long, the 2A GSHL’s third seed, on November 7. The Lumberbacks (3-6) enter the postseason having lost three out of their last four games. Rainier will play Toledo in a 2B state football play-in game on November 6. Rainier (5-4) will face Trico runner-up Toledo (8-1) on November 6 in Centralia. The Indians feature one of the state’s leading rushers in senior Taylor Hicks, who has 1,243 rushing yards this season and ran for more than 2,000 yards as a junior. Hicks, however, did not play in Toledo’s 47-13 victory over Wahkiakum due to a knee injury. His status is uncertain for the state play-in game against the Mountaineers. Capital (4-5) opened the year 1-5, but has since righted the ship in a major way, winning its final three regular season games to secure the 3A Narrows League’s fourth and final playoff spot. Quarterback Cody Jenkins has been on fire since returning from a finger injury, throwing for five touchdowns in a 49-7 rout of North Thurston and leading the Cougars to a convincing 31-0 win over Shelton in the regular season finale. Capital will travel to Vancouver to play 3A GSHL champion Columbia River (5-4) in the state play-in game on November 6. The Chieftains have had a tough go of it this year against teams from Thurston County area, losing to Tumwater (54-14) and Black Hills (46-20). Brett Thompson, James Gunther, Jack Bell, Colton Haisch and Christian Reed are anxious for a repeat game against Issaquah. 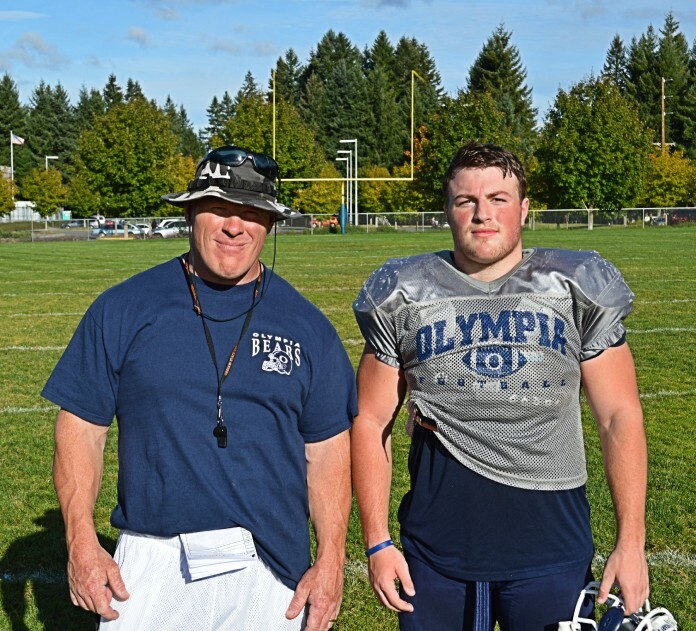 Olympia (7-2) went from being the frontrunner for the Narrows League 4A title to playing for its playoff lives over the course of just three weeks. Starting the season 6-0, the Bears, who were slowed by injuries, surprisingly dropped back-to-back games. They lost to league champ Gig Harbor 27-26 after leading 20-7 in the fourth quarter, then fell to Bellarmine Prep in overtime 16-13. Now healthy, Olympia seems to have returned to form. The Bears welcomed back starting running back Scott Gunther in their 37-9 victory over Yelm, a win that claimed the league’s third playoff spot for the Bears. Gunther, who was sidelined for two weeks with a shoulder injury, responded with a 306-yard rushing performance. David Woodward, the Bear’s do-everything offensive threat, also added four touchdowns in the win against the Tornados. Olympia will face a familiar opponent on November 6 when they travel to Issaquah to play the Eagles, the Kingco’s second-place team. The Bears knocked off Issaquah, 32-14, in Olympia on October 2. Gunther scored four rushing TDs in the victory. Issaquah (6-3) hasn’t lost since.